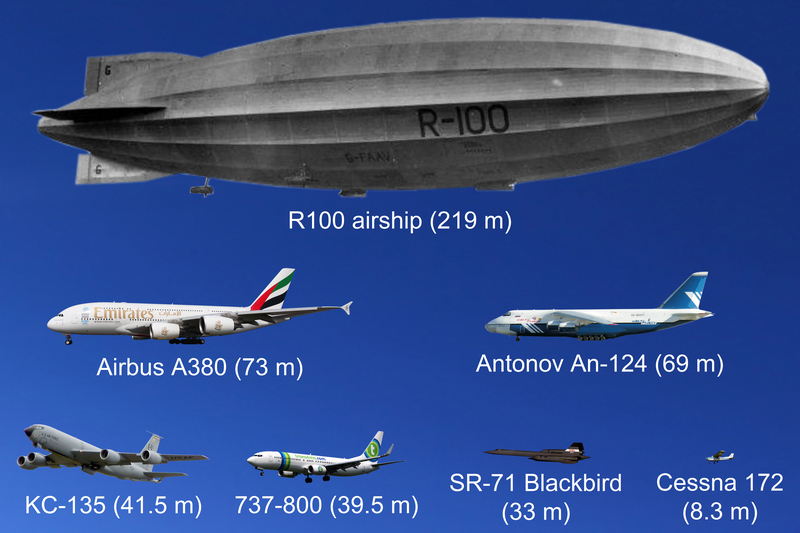 Revisiting my post on the R100 airship, here is a more detailed aircraft size comparison (click to zoom). All aircraft are to scale. I would like to supplement that with some general reflections (as I did in 2016). First, let me complement the ASC organisers on the choice of route. It was beautiful, sunny, and challenging (but not too challenging). Brilliant planning! Second, the FSGP/ASC combination worked well, as it always does. Teams inevitably arrive at the track with unfinished and untested cars (App State had never even turned their car on, I am told). The FSGP allows for testing of cars in a controlled environment, and provides some driver training before teams actually hit the road. The “supplemental solar collectors” worked well too, I thought. I was also pleased at the way that teams (especially the three Canadian teams) had improved since 2016. If one looks at my race chart at the top of this post, one can see that the Challenger class race was essentially decided on penalties. This has become true for the WSC as well. 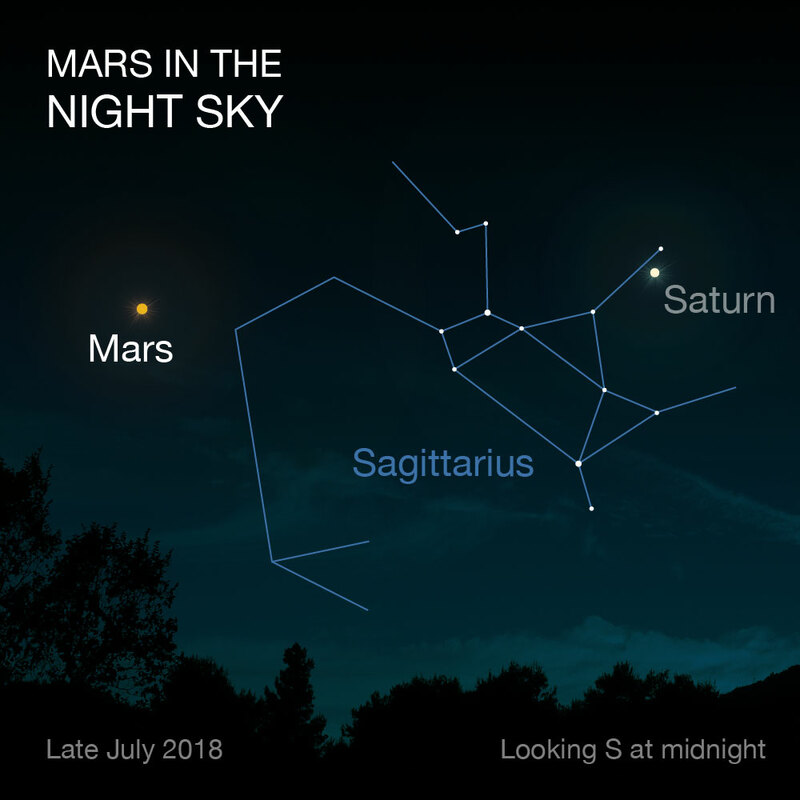 It seems that inherent limits are being approached. If experienced world-class teams each race a world-class car, and have no serious bad luck, then they will be very close in timing, and penalties will tip the balance. For that reason, I would like to see more transparency on penalties in all solar racing events. I was a little disappointed by the GPS tracker for ASC this year. It was apparently known not to work (it was the same system that had failed in Nebraska in 2016), but people were constantly encouraged to follow teams with it anyway. It would almost have been better to have had no tracker at all, instead just encouraging teams to tweet their location regularly. 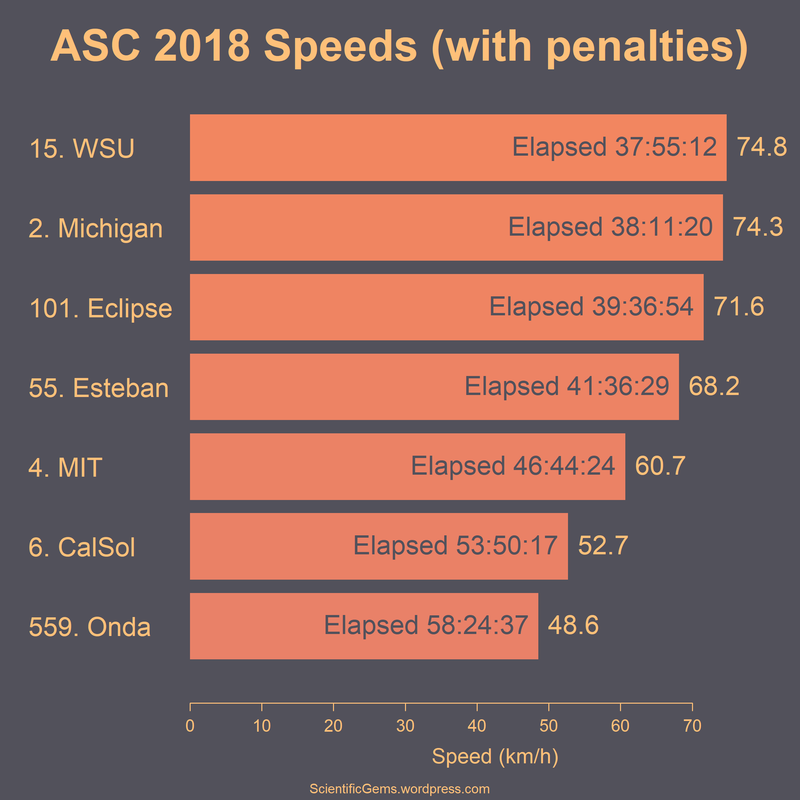 The chart below applies this suggested process to the ASC 2018 Cruisers, for various choices of penalty speed and time factor F, drawing a small bar chart for each choice. Sensible choices (with a grey background) give each car a score of at least 0.001. 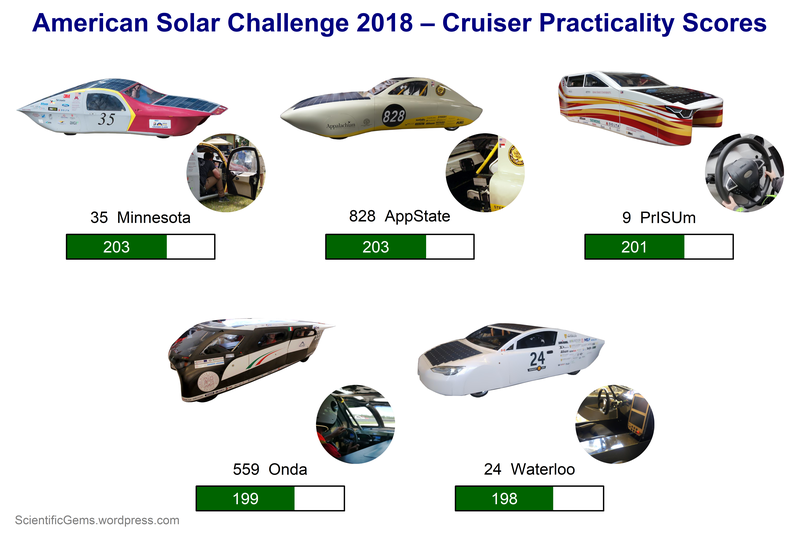 It is interesting that all sensible choices rank the cars in the sequence Onda Solare, Minnesota, App State, and Waterloo. 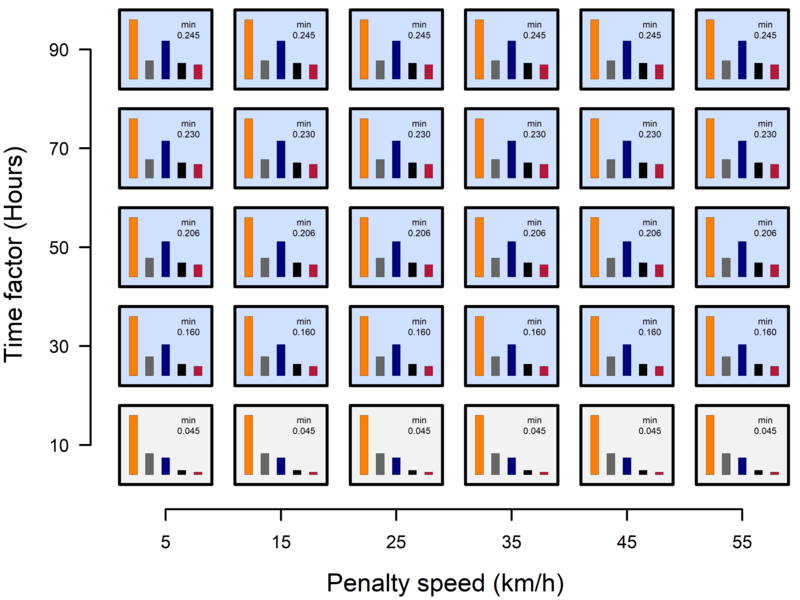 Applied to the WSC 2015 finishers (with a target of 35 hours), penalty speed is obviously irrelevant. A time factor of F = 10 preserves the rankings awarded in that event, while higher time factors would have put Bochum in second place. In that regard, note that regulation 4.4.7 for WSC 2019 is equivalent to a very tough time factor of around 1.66 hours. Of course, another option would be to return to the additive scoring systems of WSC 2013 and WSC 2015, and this has been suggested. I have posted about basic Challenger strategy. This race illustrated the fact that Cruiser strategy can be more complex. First, it is inherently multi-objective. 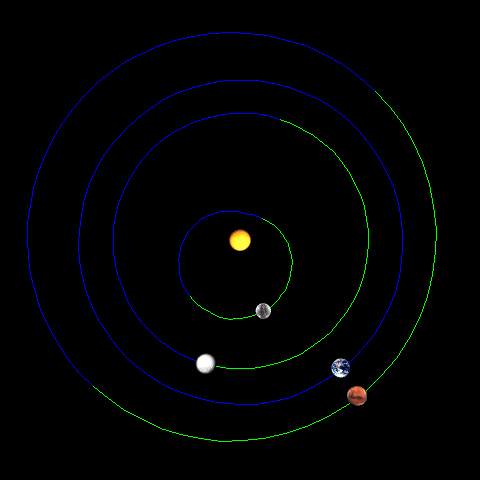 Teams must carry passengers, drive fast, and conserve energy. Those three things are not entirely compatible. Second, even more than in the Challenger class, the Cruiser class involves decision-making under uncertainty. In this event, teams could build up a points buffer early on (by running fully loaded without recharging, planning on speeding up later if needed). Alternatively, and more conservatively, teams could build up a time buffer early on (by running fast and recharging, in case something should go wrong down the track). Both Minnesota and Onda chose to do the former (and, as it happened, something did go wrong for Minnesota). In the Challenger class it is primarily weather uncertainty that requires similar choices (that was not a factor in this wonderfully sunny event). Third, even more than in the Challenger class, psychological elements come into play. Onda were, I think, under some pressure not to recharge as a result of Minnesota not recharging. In hindsight, under the scoring system used, Onda could have increased their efficiency score by recharging once, as long as that recharge made them faster by at least 3 hours and 36 minutes (not that it mattered in the end, since all teams but Onda were given a zero efficiency score). Together, factors such of these underscore the need to have a good operations analyst on the team, especially in the Cruiser class. Well, the American Solar Challenge is over. 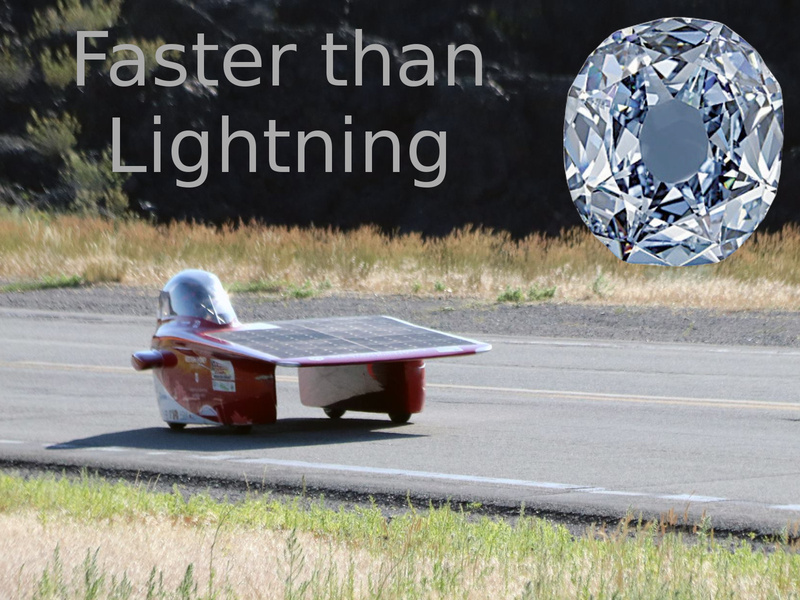 The “Faster than Lightning Gem” goes to Western Sydney University (team 15), who won by 16 minutes after a very hard-fought contest with defending champions Michigan. Western Sydney have shown themselves (again) to be one of the best teams in the world. Congratulations! 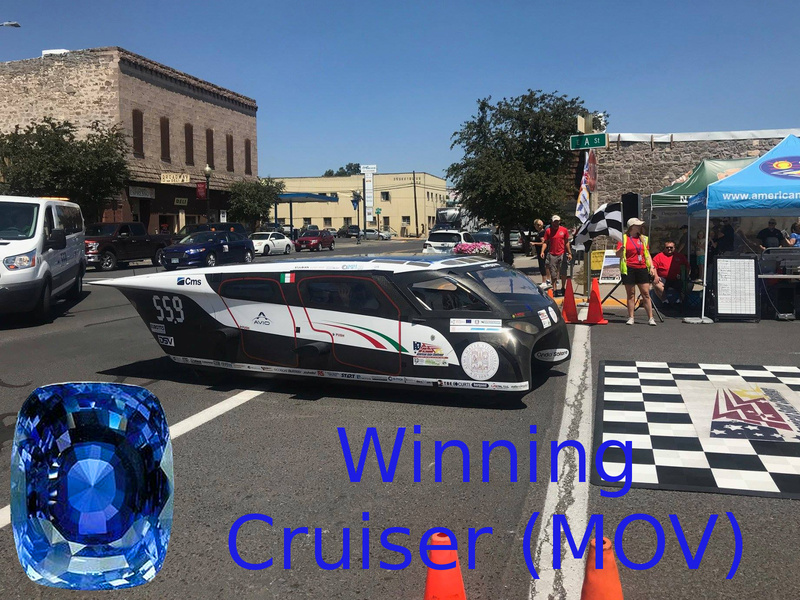 The “Multi-Occupant Vehicle Gem” goes to Onda Solare from the University of Bologna (team 559), who were the only Cruiser (MOV) to complete the entire course. They did this with 3 passengers (except for the “big climb”), zero external recharging, and zero penalties. Felicitazioni! Here are the Cruiser (MOV) practicality scores. 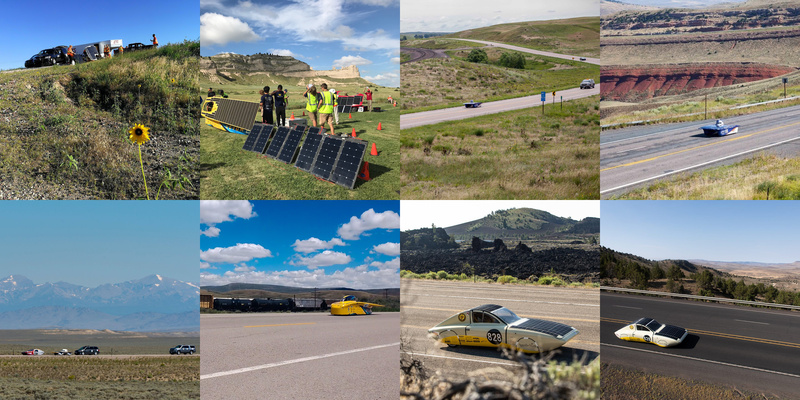 Day 8 of the American Solar Challenge was another sunny day. The road to Burns included several steep hills, climbing out of the Snake River Plain, and teams that did not negotiate them yesterday had to do so today. Appalachian State were the first Cruiser to arrive in Burns. Onda Solare are the only untrailered Cruiser, however (and still with 4 people and no external recharging). The chart below summarises the race so far (penalty minutes are added at the right of the chart). 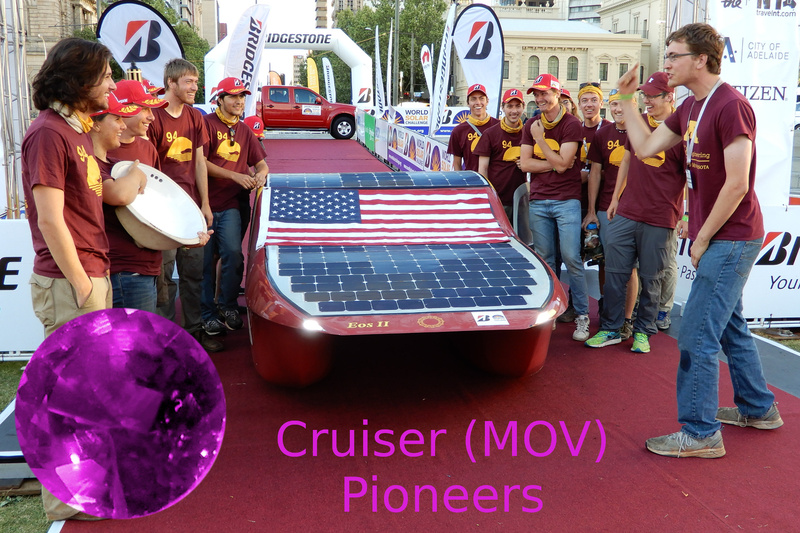 I am awarding my “Cruiser Pioneer” gem to the University of Minnesota Solar Vehicle Project, who are America’s Cruiser (MOV) class pioneers. They were the only Cruiser at ASC 2016. They came 4th in the WSC 2013 Cruiser class, and 5th in the WSC 2015 Cruiser class. 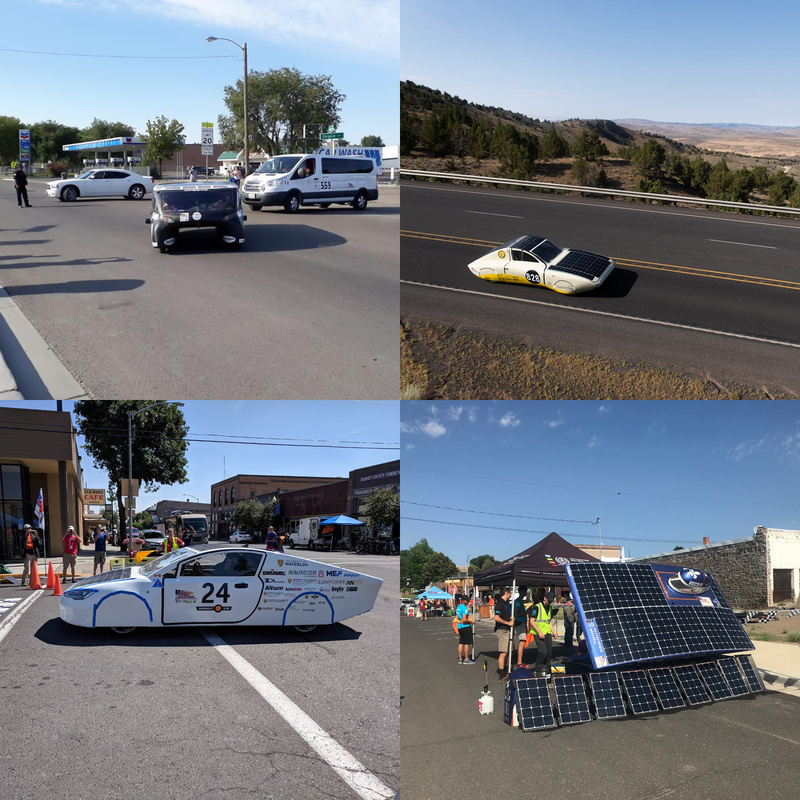 They won the FSGP MOV class this year by a convincing margin, and were clear leaders for the ASC road race until they ran into trouble 40 miles into stage 4 (with an electrical fault). Thank you, UMNSVP, for showing everybody else the way! 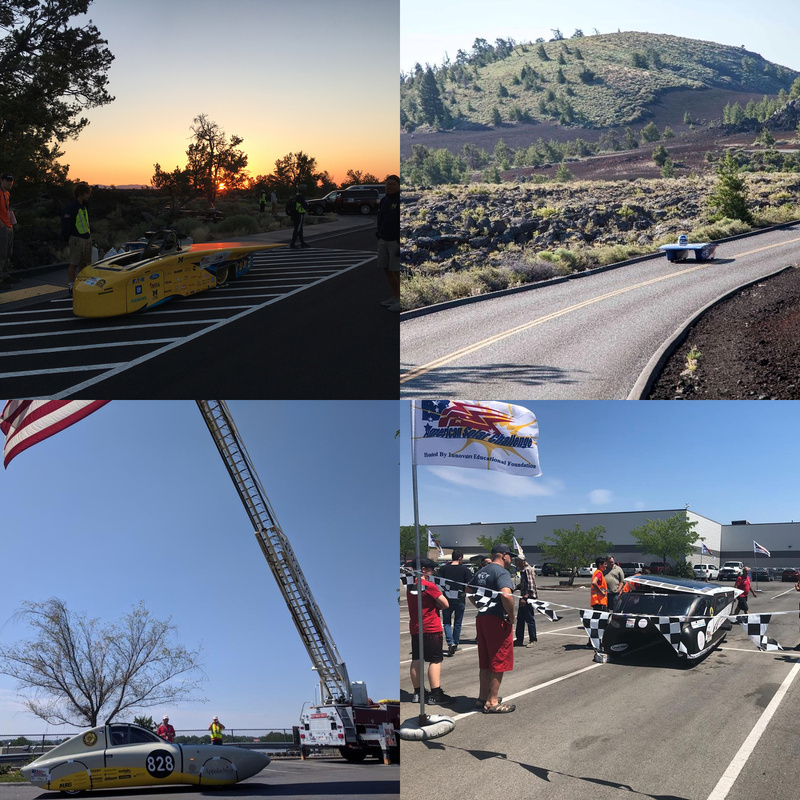 Day 7 of the American Solar Challenge was full of drama. 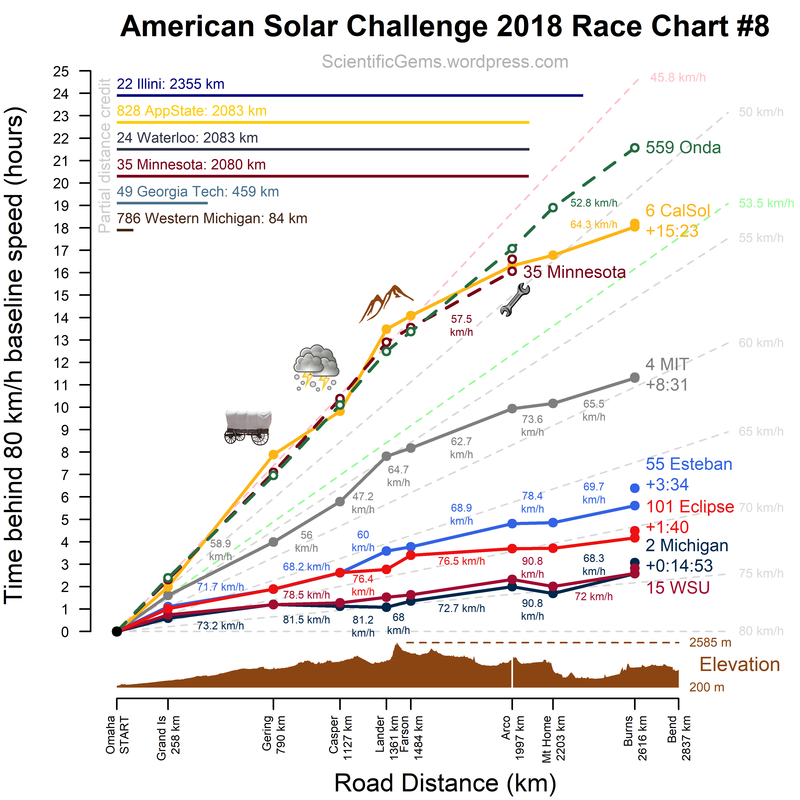 An incredible race between Western Sydney and Michigan saw average speeds to the checkpoint in Mountain Home of 90.8 km/h (56.4 mph). 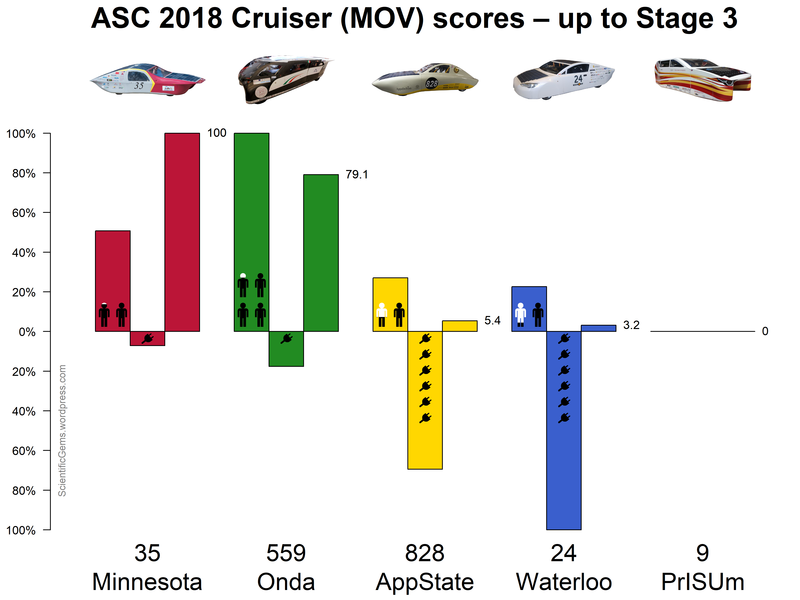 In the Cruiser class, there was a tragic breakdown by Minnesota, which I think will leave Onda Solare the winners by default. I am, however, giving my “Most Desirable Car Gem” award to PrISUm. 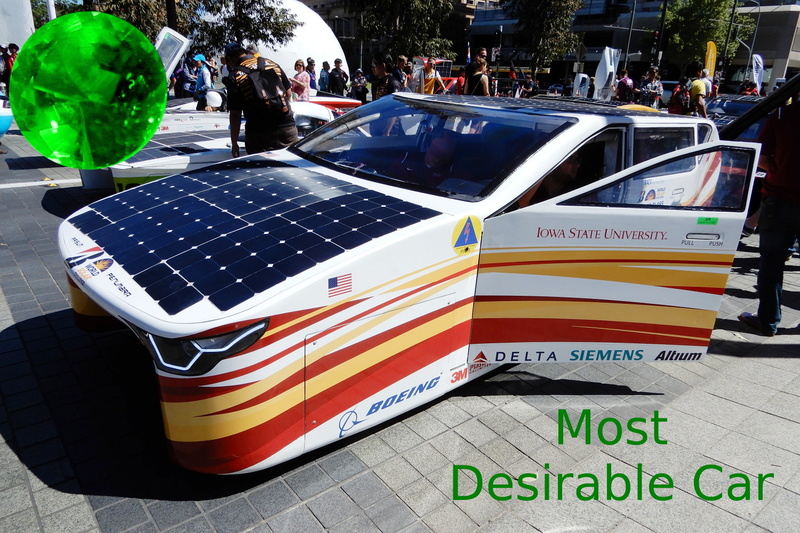 Their car did not qualify for the road race, but I still think that their “solar SUV” is a fantastic concept. And here are the night-time car positions (unreliable in the case of Michigan). I have overlaid them on my elevation map to emphasise the 850 metre downhill run into Mountain Home, and then the climb back up into Burns. 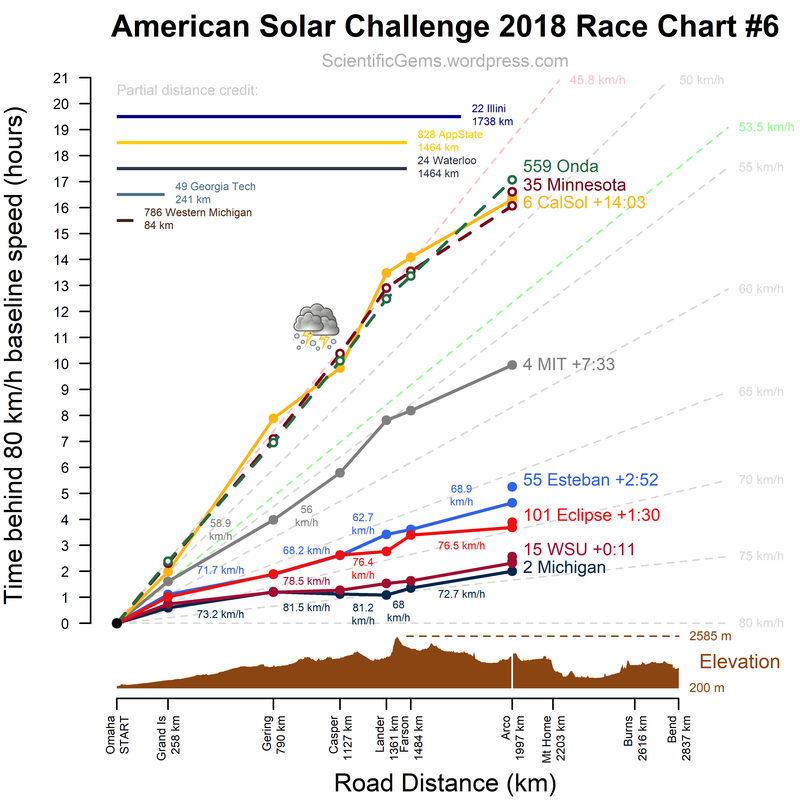 The American Solar Challenge have released official stage 3 timings, summarised in the chart above (click to zoom). Michigan and Western Sydney are only minutes apart. 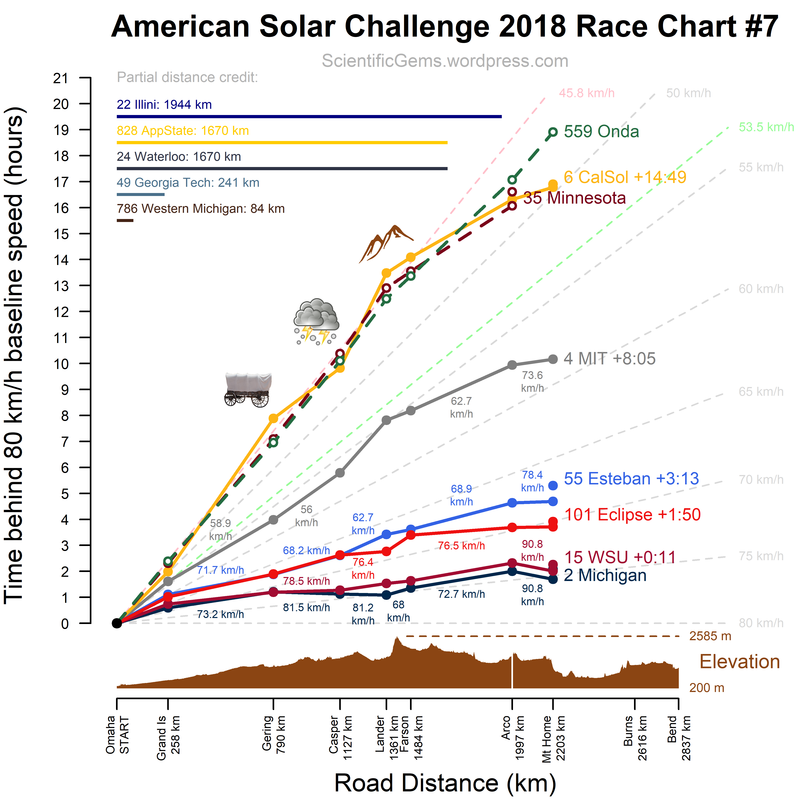 ETS Quebec / Eclipse is in third, and gaining, thanks partly to the brilliant tactic of finishing Day 3 just a few metres from the Stage 2 finish line in Lander. Given the battery impound rules, this gave them substantial additional solar recharging. 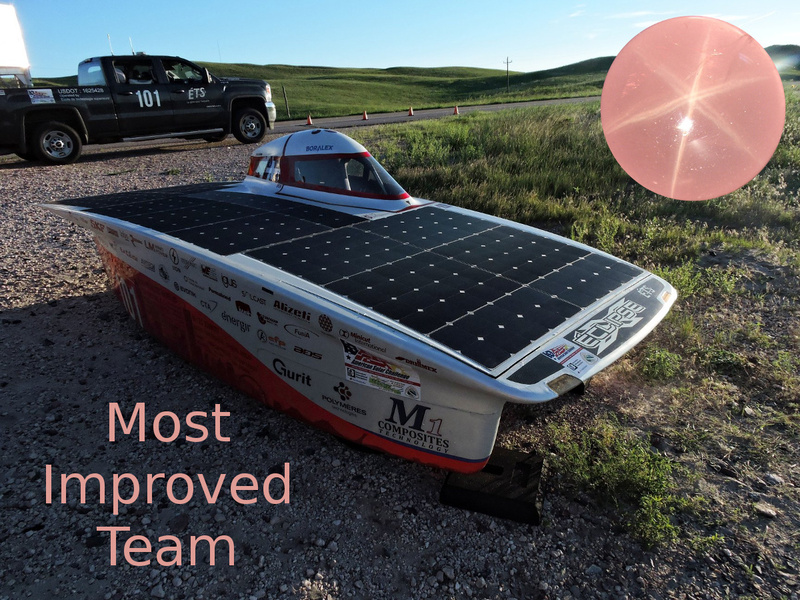 Although the American Solar Challenge is far from over, I’m already giving my “Most Improved Team Gem” award to ETS Quebec / Eclipse (team 101, formerly 92). ETS came 18th at WSC 2013 (completing only 1530 km), and 8th at ASC 2016 (after Michigan, Dunwoody/SER, Toronto, Missouri S&T, Principia, AppState, and PrISUm). With their car Éclipse X, however, I think they have reached the world top 12 level, along with teams like Toronto and Stanford. I really hope to see them at WSC again soon! And, it must be said, their compatriots in team 55 (Poly Montreal / Esteban) are not far behind them. In the Cruiser (MOV) class, the “cactus” diagram above tells the story so far. 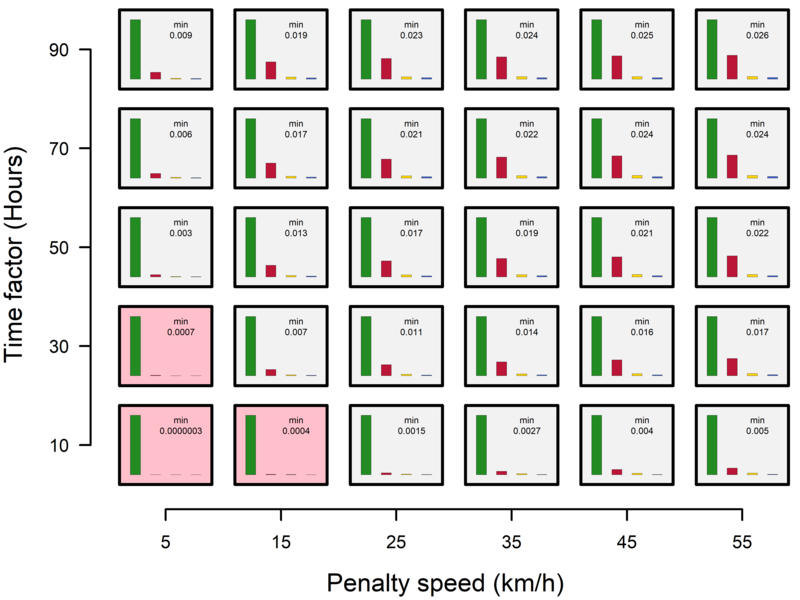 For each car, the first coloured bar shows the number of person-kilometres (distance driven times the average number of people in the car). Penalties have reduced this person-kilometre amount, so my calculation of the average number of people in the car is a little off. The second coloured bar shows the external energy input, which is the number of charges (including the pre-race charge) multiplied by the battery capacity. This bar points downward, because large values are bad. The third coloured bar, which is the final score, is the first bar divided by the second (all bars are scaled so that the highest value is 100%). 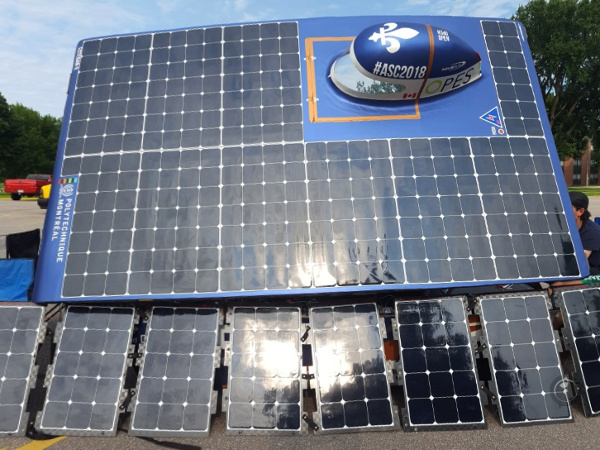 Minnesota and Onda Solare have been running on the same basis as the Challenger (SOV) cars – no external recharging during the race. This is an incredible achievement! However, the regulations specify that Cruisers should arrive in less than 53 hours (dashed green line in the top chart), with time penalties if they do not, and with cars deemed to have trailered after 62 hours (dashed pink line). 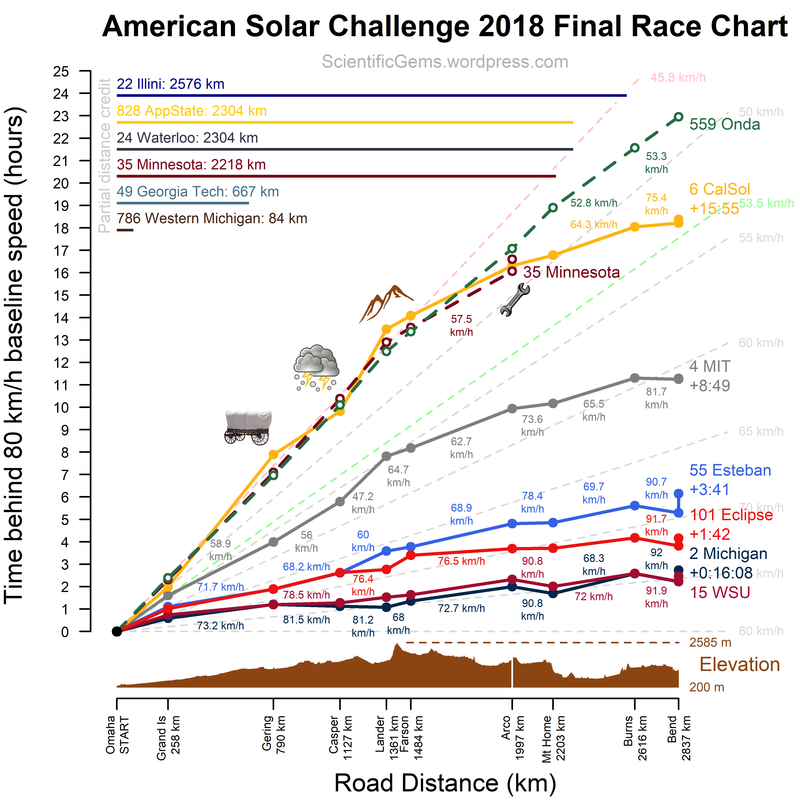 On performance to date, I estimate that Minnesota will arrive in 59.0 hours, and Onda in 59.7, which means that Minnesota’s score will be multiplied by 30%, and Onda’s by 23%. Onda can still win if they recharge from the grid and finish the race at 70 km/h or so. Eindhoven’s Stella Vie could do that, but I’m not sure that the Italian car can. They may have left recharging too late, having allowed Minnesota to dictate what kind of race was going to be run.